Does your diva have a wide variety of fashion accessories she needs storage for? give them an armoire as unique as her style with the fashion prints Leopard jewelry armoire. 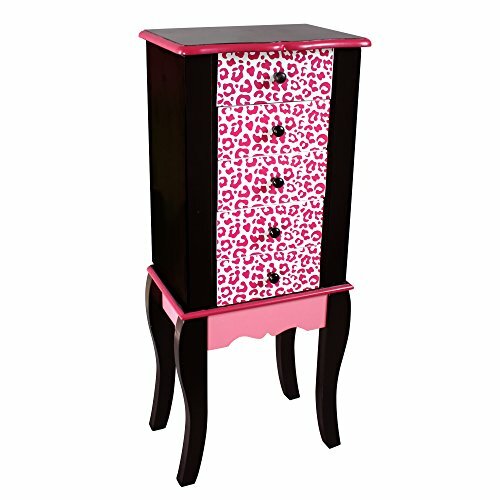 5 drawer armoire features Leopard face and hot pink trim and mirror inside the pop up lid. Armoire has storage on the sides for long chunky necklaces and accessories. Give her something she will be wild about today! 4 pull out drawers, pop up mirror, areas that open up on both sides to reveal additional storage. Safe, sturdy wooden structure made by eco-friendly MDF (CARB-P2) with lead free paints - CPSIA, EN71-1-2-3, ASTM F963 Compliant. Estimated assembly time: 30 mins. Packaged with step-by-step assembly instruction.